Mahindra's resources are huge so there is a good chance something will get made, if it does happen lets hope its something worthy (and affordable) Not something like the AJS Bedford Beezer mentioned. Yes given they spent 3.4 million quid just for the naming rights, have their own Italian design house, are doing surprisingly well in moto3, I expect we will see bikes with unique to BSA (and possibly shared with Jawa?) engines that are not off the shelf chinese copies of old honda's, or for that matter honda or yamaha engines bought in as per Ariel or the BSA regal SR500. I'd guess they may even rebrand their race bikes as BSA's, as while Mahindra have a good reputation in cars (so I'm told by my Indian work colleagues), its not a brand associated with bikes. if they want volume in markets like india then don't expect too much. We'll have to see I guess: Land Rover and Jaguar both Indian owned. Royal Enfield did take the whole works to India, whereas there's nothing left at Small Heath (or Southhampton ) to move so it will at least be a fresh start. Mahindra is looking at BSA for niche or premium markets and will launch new BSA products worldwide but not in India due to a brand dispute. This leads me to think we might see something pretty interesting designed out of their Italian group. By the way, have you looked at the products BSA Regal makes? Some are real interesting. I think they will build something worth considering, the question is whether its retro or modern . so many variations and the Italians have a history of some fabulous styling and design hits (and miss's ) . I must admit that it no linger being British made or designed doesn't concern me: The British national dish is curry and the Indian national game cricket , so I can see synergy. I’m not really interested in a new vehicle with BSA written on it somewhere, any more than I would be if it said Triumph or Norton. Wherever it is made and whoever under takes it it will just be another new bike, and one that has to meet current emissions and safety regulations. Good luck to them for sure, but I’m not in the market for a new bike. 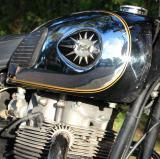 And BTW, my most modern machine is a 2007 ZRX1200. I don’t have to take any interest in it, it is just serviced once a year by someone I hand money over to; and I just press the button and it takes me where I am going. It doesn’t have ABS or fuel injection or a slipper clutch or multi-programmable suspension, and the clocks are proper round things with needles and rotating tumblers. I'd still like one and use it like your Kumansukme. the newest bike I have is an 83 CB1100F I do all the spannering. Moderns have their place and I have certainly owned my share of Japanese, Italian and German modern machinery. All of which are currently sold. It doesn't stop me thinking about another middleweight single or twin and if it happens to say BSA on the tank I wouldn't be kidding myself that it is really a modern A10 or goldstar, just a modern bike with the reliability of something new. Much like those Thai Hinkleys have nothing in common with anything Meriden ever made other than some styling elements. It certainly seems to have a lot of people fooling themselves they own a real "brit" bike without the hassles. But people do like brands, be they ford or holden (GM) down in Australasia, or H/D or triumph. I'll certainly be very interested in what they come up with and who knows might even buy one if it ticks the right boxes for me. A mate recently bought one of those new ducati scramblers and I think that has a nice blend of heritage styling clues and modern design, hopefully BSA/Mahindra find a good honest balance of style and function and don't go twin shock. I was just, this weekend, at the Chicago version of The International Motorcycle Show. I found the Triumph bikes to be at a pretty strong level of fit, finish and design. I think that must be due to design and management based in the UK. On the other hand, I could not say the same thing for Royal Endfield. Of course, these were quick impressions because it was a big show with a lot to see. I bought a "Thai Triumph" last September. 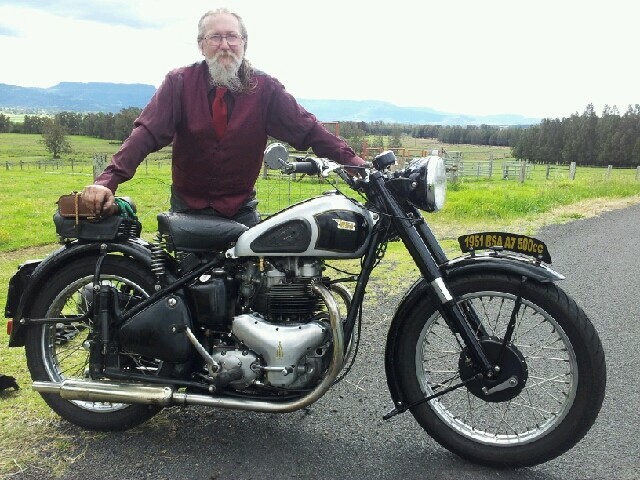 Give me the choice of taking one of my BSA's or the Triumph out and it would always be the old bikes every time. But if I want to go for a two or three hundred miler the Triumph comes out especially if it's dual carriageways or motorways. It would have been nice though if I could have bought a new BSA twin that was up to the same standards that Triumph have achieved!